AND OVER 200 DJS FROM ALL OVER THE COUNTRY! IF YOU WOULD LIKE TO MAKE A DONATION WE WILL BE ACCEPTING COATS, BLANKETS, AND FOOD AT SALON MILAN IN STONECREST MALL. FOR MORE INFORMATION ABOUT PERFORMANCES CONTACT CRYSTAL G AT 386 503-3962 OR LADY SHACK 770 676-8932. BIGGA RANKIN, DJ KUTT THROAT, DJ NEZ, ROCKY (A&R FOR UNIVERSAL RECORDS), AND MORE DJS AND TASTEMAKERS THAN YOU CAN THINK OF! PERFORMANCES AND SPONSORSHIPS ARE STILL AVAILABLE FOR MORE INFORMATION CONTACT CRYSTAL G 386 503-3962 OR LADY SHACK 770 676-8932. THEN JANUAR 22- IT’S THE MOMENT EVERYONE HAS ALL BEEN WAITING FOR! TRUST ME THIS YEAR IS GOING TO WOW YOU EVEN MORE! THE DJS WANTED US TO MAKE IT BE MORE ABOUT THE DJS WELL GUESS WHAT WE DELIVERED! 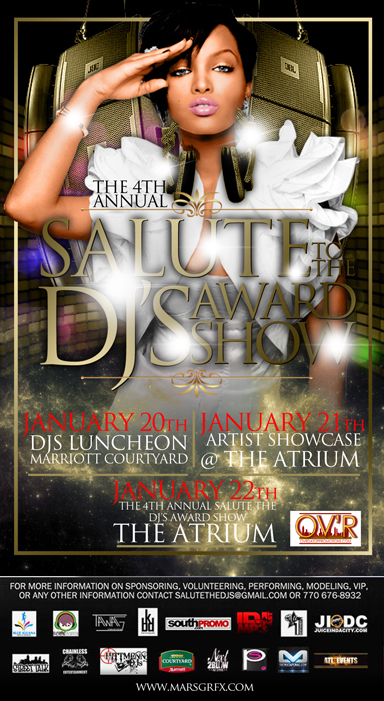 WE HAVE TONS OF SURPRISES AND THIS YEAR WE WILL BE HONORING THE LEGACY OF THE DJ! WE HAVE HIS SON COMING!! YES JAM MASTER JAY’S SON WILL BE IN THE BUILDING! THAT’S JUST ONE OF OUR LITTLE SURPRISES! SO I HOPE YOU GUYS HAVE PURCHASED YOUR TICKETS BECAUSE THIS YEAR’S SHOW IS GOING TO BE ONE EVERYONE WILL BE TALKING ABOUT FOR THE REST OF THE YEAR! I’ll be on the lookout for you!